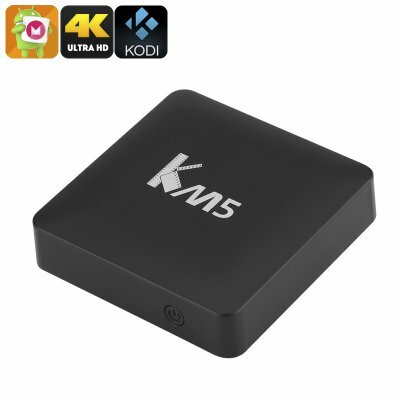 Successfully Added KM5 Android TV Box - Android 6.0, 4Kx2K, Amlogic S905X Quad Core CPU, Kodi 17.0, DLNA, Miracast, Airplay to your Shopping Cart. The KM5 TV Box is powered by one of the best Amlogic chipsets, the S905X Quad Core. this Quad Core processor is clocked at 2.0 GHz and is based on the ARM Cortex architecture. This ensures a fast and smooth operation and when paired with the Mali-T820MP3 GPU means that high definition graphics and movies can be streamed with ease. With a 4Kx2K output resolution the KM5 TV box will turn any HDMI screen into a powerful media center. Coming with Kodi 17.0 preinstalled means that the TV box can provide access to a bountiful range of free movies and TV channels from across the globe so you'll have endless entertainment every day of the week. Managing the show is the Android 6.0 marshmallow operating system. This popular Smartphone OS is now brought to the big screen and serves up a familiar and intuitive interface that can be fully customized. It is reliable smooth performance handles games, movies and multitasking with ease. Supporting Wi-Fi IEEE 802.11 b/g/n/ac you won't have to worry about wires as the K5 TV Box can be placed anywhere around your home and connect to your home network wirelessly. It will be able to stream video and download content at high speeds so you won't get watching movies online or viewing YouTube channels. The K5 Android TV Box comes with 12 months warranty, brought to you by the leader in electronic devices as well as wholesale Android TV Boxes and mini PCs..